Starting from the Meissner’s (1958) work, superconducting point contacts attracted much attention during the subsequent years both as a powerful instrument for investigation of the superconducting state and as a possibility of their utilization in application. This interest increased incredibly, especially after the breaking work of Josephson (1962) dealing with the weakly coupled superconductors. In the 1960s and 1970s many studies were done concerning the Josephson effects, Andreev reflection, subharmonic gap structure, critical and excess current, and so on using point contacts. 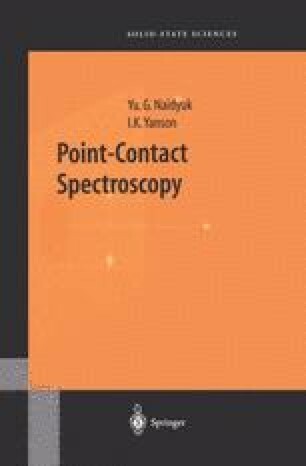 In this chapter we restrict overview of research in this field starting from the late 1970s, when, in general, the quantitative description of the I – V characteristics of S-c-S and S-c-N contacts was reached mainly after the theoretical studies by Kulik and Omelyanchouk (1977, 1978), Artemenko et al. (1979), and Blonder et al. (1982) (see the references in Chapter 3). By that time also, search for the phonon features in the superconducting contacts by PCS began [Khotkevich and Yanson (1981), Yanson et al. (1983)]. In this chapter, we present investigations separated by the range of energies probed, namely, studies of the superconducting energy gap structure in the I – V characteristics at low energy and the effect of EPI and nonequilibrium phonons on the conductivity of superconducting contacts at higher energies.